Many people ask if we can recommend any vaccine choice-friendly doctors. Dr Bob Sears (author of The Vaccine Book) maintains a good list. Dr Sears says: "That’s why I’ve created a database of a list of vaccine-friendly doctors; doctors who want to help with the vaccine decision or support parents who want to delay or decline vaccines." When talking about vaccines, some doctors will move the focus away from your individual child (or you) and speak at a population level. For example: "the risk is very small" or "vaccines are safe and effective." Always bring the doctor back to the patient by re-phrasing their assertion like this: "what can you tell me about the risk to my specific child today with our family's medical history of __________ (allergies / auto-immune diseases, etc)?" Ask for evidence of any assertions: for example, "can you show me studies proving that it is safe to vaccinate children with serious food allergies?" If your concerns are not taken seriously, remind your doctor (and you may wish to bring printouts of this) that in 2013 the Institute of Medicine published The Childhood Immunization Schedule and Safety: Stakeholder Concerns, Scientific Evidence, and Future Studies in which they clearly documented on page 6 that "The committee believes that although the available evidence is reassuring, studies designed to examine the long-term effects of the cumulative number of vaccines or other aspects of the immunization schedule have not been conducted" (emphasis added). If you think of the doctor as more of a salesperson trying to sell you something, it becomes easier to say "not today" if you aren't ready to make a decision. A good rule of thumb is to take no action until you feel comfortable with your decision. It is OK to be in the information gathering phase. If you experience pressure or bullying from a doctor, consider that the doctor is more interested in compliance rates that are being reported to the state health department and insurance companies than in your making an informed decision. If you are feeling especially bold, ask about their current vaccination compliance rate and what their targets are (and have some fun with this). 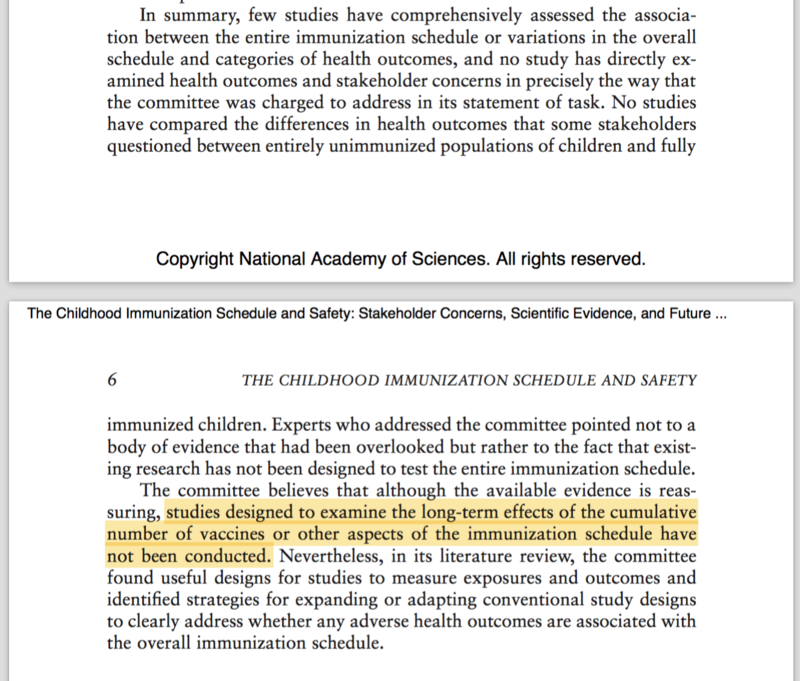 The US Government's Vaccine Injury Table is a list of adverse health outcomes that, if they happen within the specified time period after vaccination, are automatically assumed to be caused by the vaccine. This can be a useful reference to help your doctor understand that you are serious about weighing vaccine risks versus disease risks, watching for vaccine reactions and having a plan ready in case of a suspected reaction. The Vaccine Injury Table does not include all of the possible adverse health outcomes that vaccines can cause, but they are the ones recognized by US law. Some doctors will "require" you to sign a form if you decline any vaccines. If you sign this form, you become party to a legal agreement that you understand that you are going against the best medical advice and putting your child at risk. Do not sign this. We suggest saying something like: it is my policy to never sign anything without first obtaining legal counsel, so thank you for the form and I will discuss it with my lawyer. Most people, especially professionals, give way to the word "policy."